2. It is timely, therefore, to reflect again upon the nature of the Magisterium and our relationship to it, inasmuch as we are followers of Christ. Our reflection will consider the Magisterium, including the charism of infallibility; our relationship of obedience to the Magisterium; and particular challenges faced today in obeying the Magisterium. This gesture indicates, on the one hand, that the Word embraces and watches over the Bishop’s ministry and, on the other, that the Bishop’s life is to be completely submitted to the Word of God in his daily commitment of preaching the Gospel in all patience and sound doctrine (cf. 2Timothy 4) (n. 28b). A bit earlier in the Post-synodal Apostolic Exhortation, he stressed that “the proclamation of Christ always takes first place and that the Bishop is the first preacher of the Gospel by his words and by the witness of his life.” He then reminded Bishops to “be aware of the challenges of the present hour and have the courage to face them” (n. 26d). 4. The entire content of our faith, what Saint Paul in his First and Second Letters to Timothy calls the deposit of faith, is found in Sacred Scripture and Tradition (1Timothy 6:20; and 2Timothy 1:12-14). The faith, in its integrity, has been entrusted to the Church by Christ through the ministry of the Apostles. The deposit of faith is the teaching of the Apostles and the living of that teaching in the life of prayer and the sacramental life, and the witness of the teaching in the moral life. The foundation is the sound doctrine which finds its highest expression in the Sacraments, above all the Holy Eucharist, and which is witnessed in the holiness of life of the believer (cf. Catechism of the Catholic Church (hereafter CCC), n. 84). 5. The responsibility for the deposit of the faith and its transmission in every age belongs “to the living teaching office of the Church alone” (Second Vatican Ecumenical Council, Dogmatic Constitution Dei Verbum, “On Divine Revelation,” 18 November 1965, n. 10b). The “living teaching office” or Magisterium of the Church, exercised by the Roman Pontiff and the Bishops in communion with him, has its authority from our Lord Jesus Christ. Christ has conferred upon the Apostles, with Peter as their Head, and their successors, the Bishops, with the Successor of Peter as their head, the authority to teach authentically (CCC, n. 85). 6. The Roman Pontiff and the Bishops are servants of Christ and of His Holy Word. The Magisterium “teaches only what has been handed on to it. At the command and with the help of the Holy Spirit, it listens to this devotedly, guards it with dedication, and expounds it faithfully” (Dei Verbum, n. 10b). The Roman Pontiff and the Bishops in communion with him teach only what is contained in the deposit of faith as divinely revealed truth (CCC, n. 86). 7. The Magisterium, in obedience to Christ and by the power of the particular grace of the Holy Spirit, interprets the Word of God, contained in the Sacred Scriptures and Tradition, in matters of both faith and morals. The Roman Pontiff and the Bishops in communion with him define the dogmas of the faith, that is, the truths contained in the deposit of faith and “truths having a necessary connection with these” (CCC, n. 88). 8. The Roman Pontiff also exercises the teaching authority given by Christ to the Church when he canonizes a saint. Canonization is the solemn proclamation that a deceased member of the faithful has “practiced heroic virtue and lived in fidelity to God’s grace,” proposing the Servant of God as a model of the Christian life and an intercessor on behalf of the faithful who remain on earth and, therefore, continue to struggle in meeting the “high standard of ordinary Christian living” (CCC, n. 828; Pope John Paul II, Apostolic Letter Novo millennio ineunte, “At the Close of the Great Jubilee of the Year 2000,” 6 January 2001, n. 31c). The rules that the Church sets forth reflect the divine Commandments, which find their crown and synthesis in the Gospel command of love. The end to which every divine rule tends is the greater good of human beings. … Nor must we forget that the Ten Commandments have a firm foundation in human nature itself, and thus the values which they defend have universal validity. This is particularly true of values such as human life, which must be defended from conception until its end in natural death; the freedom of individuals and of nations, social justice and the structures needed to achieve it. (Pastores gregis, n. 29g). 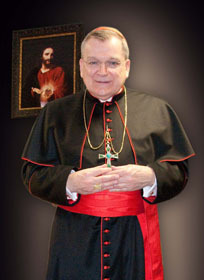 In a culture beset by what our Holy Father, on the vigil of the conclave in which he was elected Successor of Saint Peter, called the “tyranny of relativism,” the Bishop, as Chief Teacher of the faith and morals in the Diocese, carries an especially heavy and constant burden in providing the sound teaching which safeguards and promotes the good of all the faithful, especially those who cannot take care of or defend themselves (cf. Cardinal Joseph Ratzinger, Homily of the Mass: “Pro Eligendo Romano Pontifice,” 18 April, 2005). 10. The Magisterium is exercised in solemn declarations and in “catechesis and preaching” (CCC, n. 2033). The Roman Pontiff and the Bishops in communion with him are, in the words of the Dogmatic Constitution Lumen gentium, “authentic teachers, that is, teachers endowed with the authority of Christ, who preach the faith to the people entrusted to them, the faith to be believed and put into practice” (Second Vatican Ecumenical Council: Lumen gentium, n. 25). The Magisterium is either ordinary or extraordinary. The Ordinary Magisterium is all that the Roman Pontiff and the Bishops in communion with him teach. The Extraordinary Magisterium consists of the “definitions of the ecumenical councils or the ex cathedra definitions that the Popes might pronounce” (Louis Bouyer, Dictionary of Theology, tr. Charles Underhill Quinn, New York: Desclee Company, 1965, p. 290). 11. Catechesis is a most fundamental responsibility which the Bishop exercises on behalf of the good of the faithful entrusted to his care, ultimately their eternal salvation. Pope John Paul II reminded Bishops that they fulfill their responsibility by the first proclamation of the faith, or kerygma, “which is always needed for bringing about the obedience of faith, but is all the more urgent today, in times marked by indifference and by religious ignorance on the part of many Christians” (Pastores gregis, n. 29c). United to the kerygma is the catechesis of those who have embraced the faith and strive to be obedient to the faith. Pope John Paul II declared: “It is therefore the duty of every Bishop to give real priority in his particular Church to active and effective catechesis. He must demonstrate his personal concern through direct interventions aimed at promoting and preserving an authentic passion for catechesis” (Pastores gregis, n. 29d). 12. As Pope John Paul II reminded the Bishops, in the just-quoted exhortation, the Magisterium includes also the precepts of the natural law written by God upon the human heart, the requirements of conduct inherent in man’s very nature and the order of the world, God’s creation. Obedience to the demands of the natural law is necessary for salvation, and, therefore, the teaching of the natural law is within the authority of the Magisterium and part of its solemn responsibility. “In recalling the prescriptions of the natural law, the Magisterium of the Church exercises an essential part of its prophetic office of proclaiming to men who they truly are and reminding them of what they should be before God” (CCC, n. 2036). 13. Christ has endowed the Church with the gift of infallibility, the highest level of participation in His teaching authority. “This infallibility extends as far as does the deposit of Divine Revelation; it also extends to those elements of doctrine, including morals, without which the saving truths of the faith cannot be preserved, explained, or observed” (CCC, n. 2035). 14. The gift of infallibility, by which the Roman Pontiff and the Bishops in communion with Him, exercise most solemnly the teaching authority of Christ, refers to the all-generous gift of Christ to the Church by which the “whole body of the faithful cannot err in matters of belief” (Lumen gentium, n. 12). The gift is manifest in what is called the sensus fidei, which is the grace to give assent to the faith, poured out by Christ on all the faithful. The Magisterium guides the faithful by handing on to them “the faith, once for all delivered to the saints” (Lumen gentium, n. 12). The faithful, inspired by the Holy Spirit dwelling within them “unfailingly [adhere] to this faith, [penetrate] it more deeply with right judgment, and [apply] it more fully in daily life” (Lumen gentium, n. 12). It is clear that the sensus fidei is not the foundation for some democratic form of Magisterium but a reflection of the fundamental and essential obedience to the Magisterium in the lives of the faithful. This Tradition, which comes from the Apostles, makes progress in the life of the Church, as the Second Vatican Council has taught. There is likewise growth and development in the understanding of the realities and words handed down, so that in holding, practicing and professing the faith that has been handed on, there comes about a unique harmony between the Bishops and the faithful. In striving to remain faithful to the Spirit who speaks within the Church, the faithful and the Bishops converge and create those profound bonds of faith which represent as it were the first stage of the sensus fidei (n. 28d). When Bishops and faithful obediently submit themselves in mind and heart to the promptings of the Holy Spirit, the perennial truth of the faith shines forth in the whole Church for the building up of the Body of Christ and the transformation of the world. 16. The response of both Bishop and the faithful to the exercise of the teaching authority of Christ is obedience, for they recognize in the truths proclaimed, regarding faith and morals, the infallible guide to their salvation in Christ Who said to His Apostles: “He who hears you, hears Me” (Luke 10:16). The words of our Lord are unmistakable in their meaning for us. 17. In what pertains to morals, in particular, the faithful “have the right to be instructed in the divine saving precepts that purify judgment and, with grace, heal wounded human reason” (CCC, n. 2037). At the same time, the faithful “have the duty of observing the constitutions and decrees conveyed by the legitimate authority of the Church” (CCC, n. 2037). The Catechism of the Catholic Church reminds us that even the disciplinary norms of the Church “call for docility in charity” (n. 2037). One cannot fail to observe the grave harm done in the Church and in her mission to the world by the lack of obedience to the disciplinary norms regarding the celebration of the Sacred Liturgy, the teaching of the faith and the right order of the individual communities of the faithful. Our Lord Himself cautioned us that our fidelity in little things is the indispensable condition to our fidelity in great things (Luke 16:10). 21. The disposition of mind and heart to believe all that God has revealed to us and to do all that He asks of us is the obedience of faith. The obedience of faith is the fitting response to the revelation of God, which has its fullness in our Lord Jesus Christ (cf. Hebrews 11:8). Obedience to the Magisterium, the guardian and teacher of the faith, is the fundamental disposition of the baptized and confirmed Catholic (CCC, nn. 142-143). 22. The word, obey, comes from two Latin words which mean “to listen to” (CCC, n. 144). When we obey, we listen attentively to the Word of Christ, handed on to us in the Church, we believe what we hear and we put what we believe into practice. The Patriarch Abraham, who is “our father in the faith,” (Romans 4:16) is the example of the obedience which must mark our lives as followers of Christ (CCC, nn. 145-146). 23. The Blessed Virgin Mary lived perfectly the obedience of faith. At the Visitation, Elizabeth, her cousin, described Mary’s identity as Mother of the Redeemer with the words: “Blessed is she who believed that the Lord’s words to her would be fulfilled” (Luke 1:45). Mary’s response to the announcement of the Archangel Gabriel expressed perfectly the disposition of total obedience, which marked her soul: “I am the handmaid of the Lord; let it be done to me according to your word” (Luke 1:37-38). Fiat mihi secundum verbum Tuum. Mary’s response is the model of our daily response to God’s will in our lives, which the Church’s Magisterium teaches to us. The last words of our Blessed Mother, recorded in the Gospel, are the summary of her maternal instruction to us. When the wine stewards at the Wedding Feast of Cana approached her, seeking her help, she directed them to the Son of God, her Son, with the counsel: “Do whatever He tells you” (John 2:5). Obeying her maternal counsel, the wine stewards witnessed the first miracle during the public ministry of Jesus. 24. The appearances of the Mother of God, under her title of Our Lady of Guadalupe, are a wonderful example of the obedience of faith. Our Blessed Mother appeared to Saint Juan Diego to carry out her divinely given mission of leading all to Christ, of manifesting the ever-and all-merciful love of God in God the Son incarnate by the Holy Spirit in her womb. I draw attention, in the context of the present reflection, to the manner in which she carried out her mission. From the very first appearance, with its message, the Blessed Mother makes it clear that the fulfillment of her mission depends upon the Bishop. Saint Juan Diego, for his part, shares her deep esteem of obedience. His respectful love of the Bishop and of his priests whom he calls the “images of Christ” is evident throughout the account of the apparitions. The whole account of the apparitions provides a striking reflection of the Bishop and the faithful represented by Saint Juan Diego accomplishing the mission of the Church, according to the example and with the help of the intercession of the Mother of God. 25. Faith is, first of all, “personal adherence of man to God” (CCC, n. 150). When we believe all that God has revealed to us, we place all our trust in Him, in His Providence. Such trust can be placed in God alone. Faith in God the Father and total trust in His promises is clearly faith in Jesus Christ, His only-begotten Son, and in the Holy Spirit Who dwells with us always in the Church (CCC, nn. 151-152). Our Lord Jesus Christ makes us one with Him in doing all that the Father asks of us by pouring forth into our souls the sevenfold gift of the Holy Spirit: the grace of the Holy Spirit makes it possible for us to know God’s will and to do it with courage. The sevenfold gift of the Holy Spirit produces in our souls a sevenfold disposition which may be described as the obedience of faith. 26. The moral life flows from our faith in God. It is the “obedience of faith” in action. The first tablet of the Ten Commandments governs our right relationship with God, which makes possible our right relationship with others and the world, governed by the second tablet. When we fail morally, we also fail in faith (CCC, nn. 2087-2088). I often recall the words of a sage professor of Canon Law, who taught me the Church’s discipline regarding clerics. More than once, he told the class: “Where there are problems of chastity, there are problems of obedience.” Our rebellion against the moral truth is a rebellion against God and all that He teaches us. 27. Obedience to the Magisterium is difficult for man in every age. The practice of the “obedience of faith” is difficult to master. The difficulty comes both from within us and from outside of us. We suffer the effects of the sin of our First Parents, which fundamentally was a sin of prideful disobedience, of rebellion against God’s will. The grace of the Holy Spirit, poured forth into our soul through Baptism, strengthened and increased in our soul through Confirmation, and nourished within our soul through the Holy Eucharist, alone helps us to overcome our inherited tendency to rebellion and disobedience. 28. From outside of us, Satan never rests in proposing to us the same temptation which he proposed to our First Parents, the temptation to act as if God did not exist, to act as if we are gods. The world around us, the culture in which we live, to the degree that it is has succumbed to Satan’s deceptions, is a source of strong temptation for us. Our culture, in fact, has been described as “godless” both by the late and most beloved Pope John Paul II and by Pope Benedict XVI. Our culture teaches us to act as if God did not exist. At the same time, it teaches a radical individualism and self-interest which lead us away from the love of God and from the love of one another. 29. Often the lack of obedience to the Magisterium is not total but selective. Our culture teaches us to believe what is convenient and to reject what is difficult for us or challenges us. Thus, we can easily fall into “cafeteria Catholicism,” a practice of the faith, which picks and chooses what part of the deposit of faith to believe and practice. A most tragic example of the lack of obedience of faith, also on the part of certain Bishops, was the response of many to the Encyclical Letter Humanae vitae of Pope Paul VI, published on July 25, 1968. The confusion which resulted has led many Catholics into habits of sin in what pertains to the procreation and education of human life. 30. The lack of integrity in obeying the Magisterium is also seen in the hypocrisy of Catholics who claim to be practicing their faith but who refuse to apply the truth of the faith in their exercise of politics, medicine, business and the other human endeavors. These Catholics claim to hold “personally” to the truth of the faith, for example, regarding the inviolability of innocent and defenseless human life, while, in the political arena or in the practice of medicine, they cooperate in the attack on our unborn brothers and sisters, or our brothers and sisters who have grown weak under the burden of years, of illness, or of special needs. Their disobedience pertains not to some truth particular to the life of the Church, that is, not to some confessional matter, but to the truth of the divine natural law written on every human heart and, therefore, to be obeyed by all men. Prayer is an indispensable condition for being able to obey God’s commandments (n. 2098). Contemplative prayer is hearing the Word of God. Far from being passive, such attentiveness is the obedience of faith, the unconditional acceptance of a servant, and the loving commitment of a child. It participates in the “Yes” of the Son become Servant and the Fiat of God’s lowly handmaid (n. 2716). 32. Secondly, we must prolong our union with Christ in His Eucharistic Sacrifice throughout the day. We must embrace those sacrifices, both small and great, which are necessary if we are truly to love God and our neighbor (CCC, nn. 2099-2100, and 2340). If we are to meet the great challenges in the following of Christ, we must discipline our thoughts and desires, so that they become more Christlike. The more we practice self-discipline, the easier it becomes for us to grow in the obedience of faith. 33. Prayer and sacrifice necessarily lead us to attend to our growth in the life of the virtues. Prayer and sacrifice both unveil for us the virtues which make obedience possible and win for us the grace of the Holy Spirit to grow and develop in those virtues, for example, justice, prudence, temperance, fortitude, humility, chastity, and, above all, charity (CCC, nn. 2340-2342). 34. Prayer, sacrifice and the practice of the Christian virtues lead us to hear God’s Word ever more attentively in our lives and to put it into practice, without hesitation or compromise. There is no other way to know God’s will in our lives and to do it, to know who we are and to be true to our identity. Clearly, they are the most important heritage for us to hand on to our children and young people. Even in the most difficult situations man must respect the norm of morality so that he can be obedient to God’s holy commandments and consistent with his own dignity as a person. Certainly, maintaining a harmony between freedom and truth occasionally demands uncommon sacrifices, and must be won at a high price: it can even involve martyrdom (n. 102a). How often our beloved Father John A. Hardon, S.J., taught us that living the Catholic faith today in our totally secularized society demands a readiness to give the ultimate witness of martyrdom! His essential task is to help the People of God to give to the word of revelation the obedience of faith (cf. Rom 1:5) and to embrace fully the teachings of Christ. One could say that, in a Bishop, mission and life are united in such a way that they can no longer be thought of as two separate things: we Bishops are our mission. If we do not carry out that mission, we will no longer be ourselves. It is in the transmission of our faith that our lives become a visible sign of Christ’s presence in our communities (Pastores gregis, n. 31b). Both are necessary. The former [authority], in fact, gives rise to the objective requirement that the faithful should assent to the authentic teaching of the Bishop; the latter helps them to put their trust in his message (Pastores gregis, n. 31c). 37. It is my hope that these few reflections will help us all to understand the fundamental importance of obedience to the faith for our eternal salvation and the irreplaceable service of the Bishops in leading us all to an ever purer and stronger obedience. There is no other way to salvation than hearing God’s Word and putting it into practice with all our being. The Letter to the Hebrews which teaches us, in a particular way, the “obedience of faith” reminds us that our Lord Himself “learned obedience from what He suffered” and thus became the source of eternal life, of eternal salvation, for us all. We ask for the obedience of Christ each time we pray to God the Father in the words which our Savior Himself taught to us: “Thy will be done on earth as it is in Heaven.” We pray through the intercession of the Blessed Virgin Mary, that we may imitate her belief that God’s promises to us will be fulfilled. 38. I conclude with the teaching of the Catechism of the Catholic Church, inspired by our prayer, Christ’s prayer in us, that God’s will be done in all things. How much more reason have we sinful creatures to learn obedience – we who in Him have become children of adoption. We ask our Father to unite our will to His Son’s, in order to fulfill His will, His plan of salvation for the life of the world. We are radically incapable of this, but united with Jesus and with the power of His Holy Spirit, we can surrender our will to Him and decide to choose what His Son has always chosen: to do what is pleasing to the Father (n. 2825). May the Blessed Virgin Mary, Mother of the Church and Queen of the Apostles, intercede for us, that we may grow in the obedience of faith, in obedience to the Magisterium, for our own salvation and for the salvation of the world. Church Teaches Forum, Louisville, Kentucky. Presentation given on July 15, 2006.